Trappist monk Matthew Kelty was a joyful and soulful subject of a documentary on soul searching for Morgan Atkinson. The Trappists are a religious group known for silence, prayer, labor and isolation from the world. Father Matthew was not what most people expect. 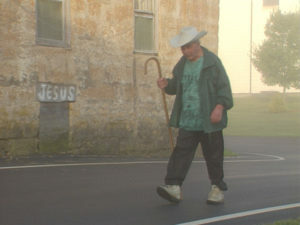 He worked hard and certainly prayed, but he also talked a lot, laughed just as much, and as the guest house chaplain at the Abbey of Gethsemani, was very much in touch with the world. In his long life, Father Matthew had been a hermit, a lover of motorcycles, Thomas Merton’s confessor, a missionary and most importantly a man seeking to grow ever deeper in his relationship with God. This program looks at the spiritual journey of Father Matthew and the wisdom he gained along the way. His words, coupled with remarkable scenes of monastic life, inspire, inform and enlighten.